Cigars by Chivas will be hosting the first West Coast competition for the longest cigar ash. The event is at the shop on Friday, May 5th at 6:00 p.m. – and is a unique opportunity to keep ash from dribbling into your lap, win a prize valued at $4000, and get a chance to go to New York to participate in the United States longest ash competition. In turn, that will win you a free trip to Croatia to participate in the world championship. 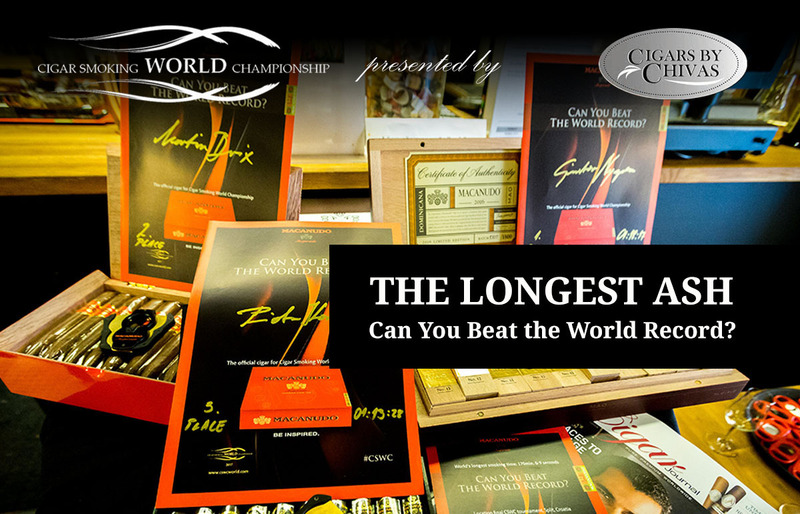 And who wouldn’t want to be the world’s longest cigar ash champion? The buy in for the event is $40, which gets you a cigar and a chance at developing the longest ash in the room. It also gets you refreshments both liquid and solid, a gift bag to take home…and a few extra surprises. We were going to bring in Don Amador to be the judge, but he has a wedding to go to that weekend, so we’re going to have our own panel of expert judges to measure your ash. You’ll discover all the judging details on the evening. Don’t worry: they’re objective and fair. We’re taking the competition seriously. The winner gets to take home a Swiss-made Curvo y Sobrinos watch, valued at over $4000. He also gets a free pass to the New York round of the competition, valued at $150 (although he’ll be responsible for his own travel expenses.) Win in New York, and you get flown to Croatia for that world championship. The runner-up gets a set of three free passes to the New York round (total value $450) – so he can bring two of his buddies along to try for that Croatia trip and the crack at the title. We also have three limited edition cigar boxes from General Cigar to be given away as prizes. Nobody’s going home empty handed, as we’ll have gift bags for all participants. This is not your father’s cigar shop event – so RSVP to 626-395-7475 and join us for a unique evening on the 5th.